Penn State Student Given 18 Drinks In 82 Minutes Before Hazing Death, Prosecutors Say : The Two-Way The district attorney filed new charges against members of the Beta Theta Pi fraternity Monday, saying recently recovered video shows them giving Timothy Piazza massive amounts of alcohol. 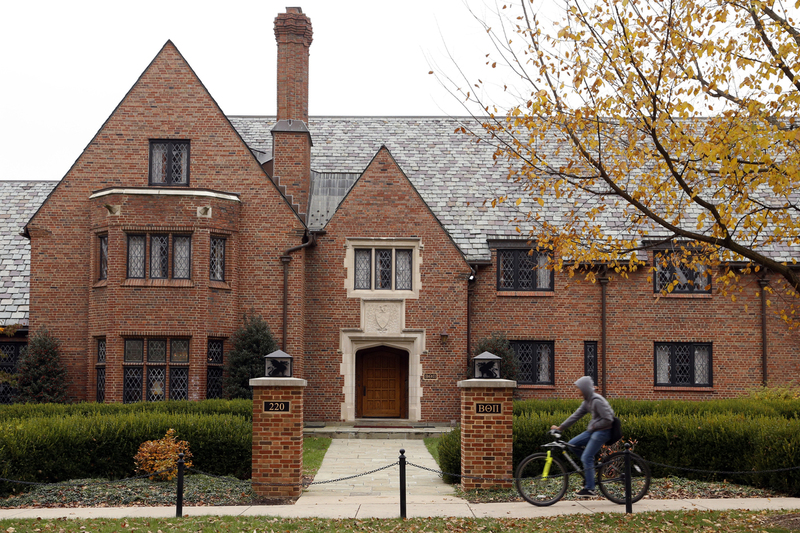 Prosecutors filed charges against 12 members of Penn State's now-shuttered Beta Theta Pi chapter and added to the already-existing charges against five others. Prosecutors have filed new charges against members of the Beta Theta Pi fraternity at Penn State, alleging that newly recovered video shows them serving pledge Timothy Piazza excessive quantities of alcohol. The charges filed Monday — which range from involuntary manslaughter to aggravated assault and hazing — rely on surveillance footage taken during the pledge event connected with the 19-year-old's death. Piazza received "at least 18 drinks in over 1 hour and 22 minutes," Centre County District Attorney Stacy Parks Miller said at a news conference Monday, and he "never once obtained any of those drinks for himself. Brothers [in the fraternity] were coming up to him and giving him those drinks." That night after the February event, Piazza drunkenly fell down the stairs and sustained the injuries that led to his death less than two days later. "When law enforcement initially evaluated the video footage, fraternity brothers led police to believe that the basement cameras had been inoperable on Bid Acceptance Night," Parks Miller's office said in a statement. "However, after later examining one of the DVR surveillance boxes, State College Police uncovered evidence that the basement camera footage had actually been manually deleted just as State College Police were poised to take possession of the recording equipment." "State College Police sent the box to the FBI, whose agents were able to restore the video from the deleted hard drive," the district attorney's office said. Prosecutors filed charges against 12 members of the fraternity and added to the already-existing charges against five others. "In all," The Philadelphia Inquirer reports, "25 Beta Theta Pi members now face charges." The new allegations mark a significant escalation in a case that has taken several twists since the Dauphin County coroner initially ruled Piazza's death an accident. In May, a grand jury revised that assessment, calling it "the direct result of encouraged reckless conduct." As NPR's Bill Chappell reported at the time, charges were pressed against 18 members of the fraternity, including eight who were charged with involuntary manslaughter. The grand jury document referenced surveillance footage other than the recently recovered video. That previous footage allegedly depicted Piazza, severely under the influence, falling head-first down the stairs at about 11 p.m. and falling again around 5 a.m., hitting his head against a metal railing. At various points in between, fraternity brothers allegedly slapped Piazza several times in the face and stomach. It would be nearly another six hours before an ambulance was called for Piazza, who died with traumatic brain injuries and a ruptured spleen. "In September, Judge Allen Sinclair gutted the prosecution's case, throwing out the most serious felony charges against the fraternity members and saying prosecutors had not presented enough evidence to support them. "Parks Miller has vowed to push forward with the case and refiled those felony counts last month. "She has asked that the case be reassigned to another judge, but she is working against the clock. She lost a primary election in the spring and is set to leave office in January. Her successor — Bernie Cantorna — has not said whether or not he intends to proceed with the prosecution." At the news conference Monday, Piazza's father said he is committed to pursuing the charges against the members of the fraternity, which has been shut down by Penn State. The school has also changed the way it regulates fraternities and sororities, assuming more control over disciplinary procedures. Piazza "was a happy and caring human being" who "was killed at the hands of those he was seeking friendship from," his father said, according to ABC News. "The visions of him lying in a hospital bed battered and bruised and on life support ... make no sense. He was just trying to join an organization."